Ed Sealover of the Denver Business Journal and John Frank of the Denver Post. There is bipartisan support during the 2018 legislative session for a slate of bills on two major topics, consumer data protections and combating Colorado’s opioid epidemic. The measures are slated to get their first hearings this month, but there are still disagreements on how any legislation will ultimately come together. 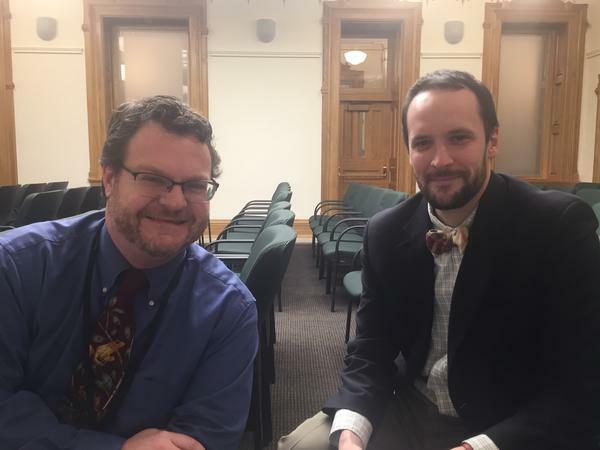 Statehouse reporter Bente Birkeland spoke with Ed Sealover of the Denver Business Journal and John Frank with the Denver Post about some of the significant pieces of legislation ahead. Statehouse reporters preview some of the significant bills coming up for hearings later this month at the state capitol. Sealover: A couple of them are looking at the idea of parents being able to freeze consumer reports for minor children that are being developed. Those seem to have universal support. You’ve got another bill that would allow adults to freeze their consumer information reports. That one is being fought heavily by the consumer data information association because they say this is essentially clouding someone’s record and sport a clean consumer record when they really shouldn’t have. On the slate of bills to deal with opioid addiction in Colorado and improve treatment options that came from a study committee that met in the interim before session. Frank: The most watched bill is about a safe injection site, which would most likely be in Denver. This would be a site that would allow drug users to shoot up in a space one with clean needles, and two with supervised medical professionals who could then respond with an overdose antidote if they OD’d. If had unanimous support out of committee but now the politics behind it are changing. It’s interesting. It’s running into some resistance in the Republican led state senate. The deal on this one could be falling apart. Right now, lawmakers are scrambling to rewrite the bill.